Female Voices - MorphVOX Add-on 1.4.2 is chat & instant messaging software developed by Screaming Bee LLC. This free voice add-on gives MorphVOX voice changing software, six realistic women voices including: Agnes the grandmother, Donna the tough biker, or Celeste the idealistic college student. 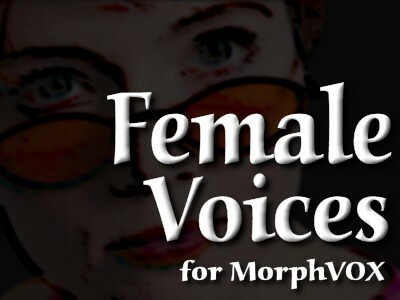 From the makers of MorphVOX Voice Changer, Female Voices can change your identity and enhance role-play in online games. Note: This add-on requires the full version of MorphVOX Voice Changer Software 2.8.1 or above. This chat & instant messaging software is freeware, which means you can download and use Female Voices - MorphVOX Add-on 1.4.2 absolutely free. There's no need to buy the product. Female Voices - MorphVOX Add-on 1.4.2 supports different languages (including English). It works with Windows XP/Vista. We have tested Female Voices - MorphVOX Add-on 1.4.2 for spyware and adware modules. The software is absolutely safe to install. We has completely tested chat & instant messaging software Female Voices - MorphVOX Add-on 1.4.2 many times, written and published the interesting article and uploaded installation file (651K) to our fast server. Downloading Female Voices - MorphVOX Add-on 1.4.2 will take several seconds if you use fast ADSL connection.